Popular American car-maker General Motors will be launching Chevrolet’s new SUV dubbed as Trailblazer in India on October 21. Chevrolet Trailblazer was first showcased in India at the 2012 Delhi Auto Expo. The car’s 2.8 Litre Diesel engine is enormous! The price of Trailblazer SUV is expected to in the range of INR 25 lakhs to INR 30 lakhs (ex showroom Delhi). The company, General Motors would be bringing the new Trailblazer to India via the CBU route and the car will be assembled at company’s Halol plant in state of Gujarat. Chevrolet’s sales number is not that good in the recent past. With this car launch during festive season, the company aims to make profits with a good turnaround. Talking about the colors, the new Chevrolet Trailblazer comes in seven different exterior colours – blue, white, brown, black, grey, red and silver. The official Chevrolet India company website now features the new Chevrolet Trailblazer SUV prominently, which is yet-to-be-launched and is expected to hit the showrooms in India on October 21. 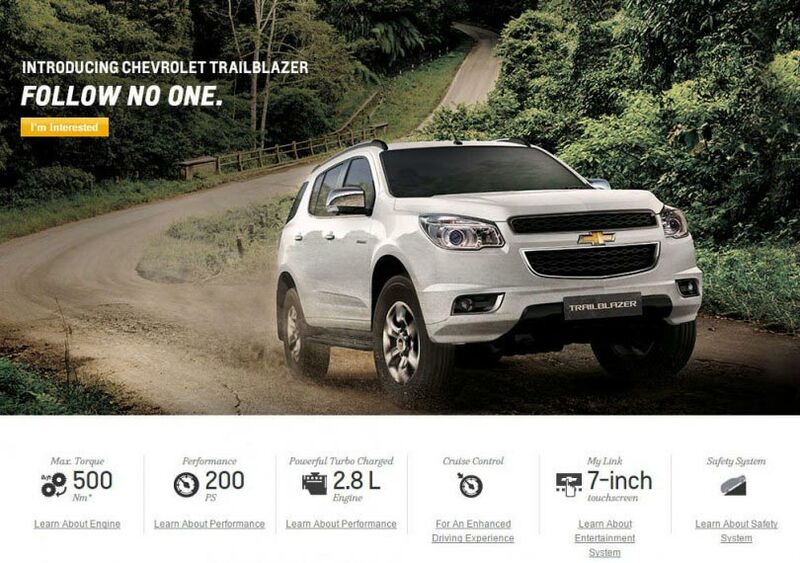 The India specific Chevrolet Trailvlazer is going to be offered in only one flavour -top spec LTZ variant. Chevrolet Trailblazer is a huge car and a proper SUV that measures 4878mm in length, 1902mm in width, 1847mm in height and 2845 mm in wheelbase. So, who are the competitors of new Chevrolet Trailblazer? The potential rivals of Chevrolet Trailblazer are Toyota Fortuner, Ford Endeavor, yet-to-be-launched Nissan X-Trail and Hyundai Santa Fe.